India is called as the pharmacy of the world with every 3rd tablet sold in the world is by an Indian manufacturer and every 5th patient treated by an Indian doctor. However, it is also ironic that it is only 40 per cent of the Indian population who has access to basic healthcare facilities. This is all set to change now with the launch of Ayushman Bharat- Pradhan Mantri Jan Arogya Yojana, stated Malti Jaswal, Sr Consultant, World Bank at the CII Healthcare, Pharma and Medtech Conclave 2019- Making Healthcare Accessible Affordable and Sustainable at Mumbai. Jaswal mentioned that under the scheme, primary health centres from the most rural areas in the country would be converted to health and wellness centers (HWC) which would be well equipped for universally screening of common non communicable diseases such as diabetes, hypertension and three common cancers. “The idea is set up 150, 000 HWC by December 2022. Almost 10 lakh people have already benefitted under the scheme since its launch and ₹ 1456 crores have been spent,” she informed. In the first year, the scheme is expected to generate a demand for 43000 additional hospital beds and 5000 more doctors. “The scheme is believed to result in 1.7 crore hospitalisations in the first year. Out of the total spending almost 40 per cent or ₹ 5260 crore would go to the public sector hospitals and ₹ 7250 crore or 60 per cent would go to the private sector,” she added. Maharashtra has been operating the biggest public healthcare scheme in India since the year 2012 under which 2.25 crore families have been covered. “Nearly 90 per cent of the families with ration card have been covered under the scheme whereby an insurance cover of ₹ 1.5 lakh is offered to the families. The government pays an insurance premium of almost ₹ 2000 crore in premium. The entitlement under the scheme is based on the colour of ration card,” Dr Sudhakar Shinde,CEO, Jeevan Dayee Yojana Maharashtra explained. There are three ration card schemes like yellow, orange and white based on their income limit. According to Dr Shinde, almost 22 lakh Indians have been benefitted under the scheme. “For every ₹ 100 of amount claimed, nearly ₹ 96-97 is disbursed. 90 per cent of all the claims are paid within just 10 days of it getting posted on our website,” He added that the scheme has been extended to 2 lakh additional families last year. “UK has a well-developed healthcare ecosystem and has been collaborating with the government of India in the Healthcare space. 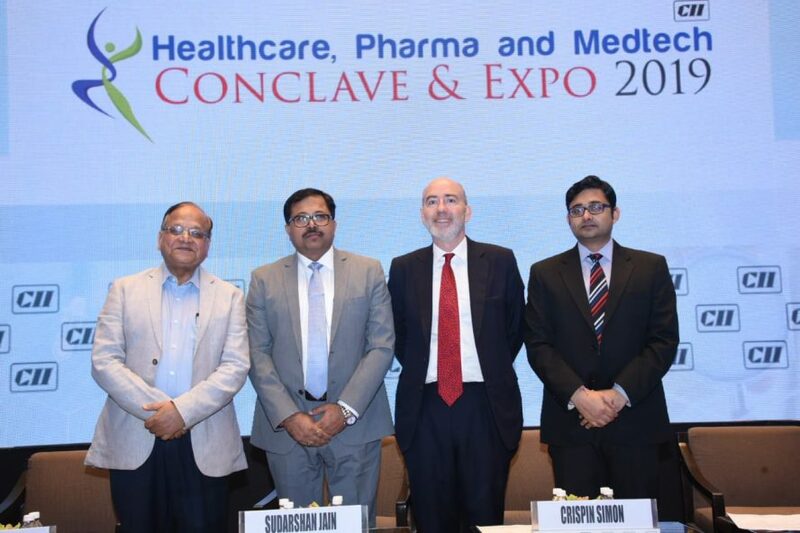 Realising the potential of artificial intelligence in the field of healthcare, both the prime ministers of UK and India did have collaborative agreements in the month of April 2018 for best solutions in primary healthcare which are a priority for the government of India,” Crispin Simon, British Deputy High Commissioner Western India, Her Majesty’s Trade Commissioner South Asia said. Joy Chakraborty, Chairman- CII WR Healthcare, Pharma and Medtech Conclave and Expo 2019 and Chairman CII WR taskforce on Healthcare emphasised that an unprecedented regulatory framework has been developed in the healthcare sector in the last two years in the country. “Government programmes like the Ayushman Bharat would be a game changer with even the underprivileged getting access to quality healthcare. Due to these programmes, there would be a demand for at least one million doctors and 2.5 million medical workers by the year 2025,” he added. Sudarshan Jain, Former MD, Abbott Healthcare and senior Advisor, APAX Partners explains that in India there is too much focus on the cost rather than value driven. “There is too much focus on the affordability. This does not help in creating infrastructure. There are five ‘S’ that is very important to develop the healthcare sector. They are Supply driven model, Stability, Scaling up of operation, Sustainability and Synergy.